ON THIS DATE (May 7, 2004) ... The axiom major leaguers live by is keep your highs low and your lows high, but that was hard to do as the Red Sox came back to beat the Royals, 7-6, on a walk-off, pinch-hit double by Jason Varitek last night at Fenway Park. After Tim Wakefield had gutted out eight innings and had allowed four earned runs, Sox batters chipped away at a 6-2 deficit to win their first home game after a not-so-pretty road trip through Texas and Cleveland. The game ended in a magical ninth inning, culminated by a line-drive double to the right-field corner by Varitek. Most of the 35,280 weren't watching the ball dance around the corner as Juan Gonzalez tracked it down, or Gonzalez's relay to Desi Relaford. Everybody, including all the Red Sox on the dugout steps, was watching Manny Ramirez as he huffed and puffed around the bases. Ramirez made good turns at second and third on his way home. Third base coach Dale Sveum was halfway down the line giving Ramirez a windmill motion. Ramirez didn't think the play was going to be as close as it was. He had his eyes trained on Royals catcher Benito Santiago, who faked Ramirez. It was, from Wakefield's gutsy effort, to Doug Mirabelli's run- scoring single in the eighth, to Mark Bellhorn's home run in the ninth that that set the stage for Ramirez and Varitek. 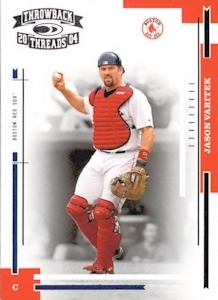 It was Varitek's first time facing Royal reliever Scott Sullivan, who was a premier set-up man in the National League before joining Kansas City this season.